Back (L-R): Paul Crossman; Tom Leypoldt; Alderman William Notte; Alderman Dave Allaire; Trevor Bendig; Sen. Brian Collamore; Brennan Duffy, Rutland Redevelopment Authority; Rep. Larry Cupoli; Rep. Tom Terenzini; Bill Ackerman. 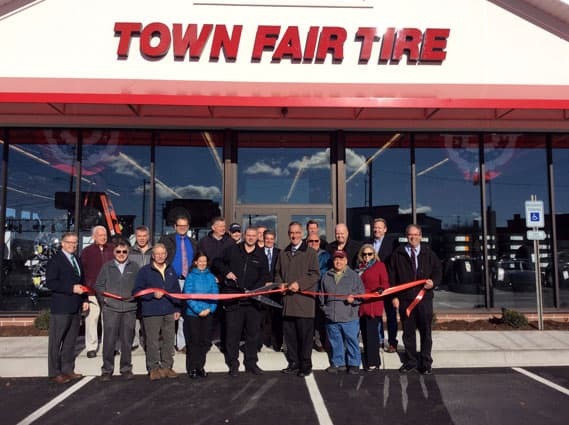 RUTLAND—On Nov. 24, the Rutland Region Chamber of Commerce led a ribbon-cutting ceremony for Town Fair Tire, which opened recently at 162 South Main St. in Rutland. Town Fair Tire has 91 tire store locations throughout New England. This new store, however, is its first location in Vermont. Town Fair Tire offers several brands of tires, tire rotation, tire change over, wheels and alignment.